It’s October.. you know what that means? Another month filled with spooktacular Halloween reads! And who could have a month of horror without Uncle Stevie? Not this guy, that’s for sure. 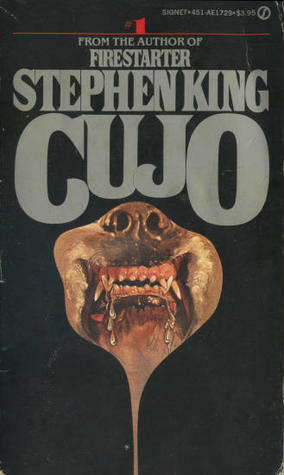 So I’ve dug into the past and selected one of Sai King’s early books, Cujo. Yes, a book that was written by an author so hopelessly consumed by cocaine he doesn’t even remember writing it. Does this book have bite? Or is it all bark? The book sees us return to Castle Rock following the events of The Dead Zone where a beloved family dog comes down with a particularly nasty case of rabies (are there any good cases?). The novel follows two families; the Cambers (the owners of the killer Saint Bernard) and the Trentons. Both families are on the brink of collapse prior to Cujo’s reign of terror. Joe and Charity Camber have never had an easy marriage and the long-suffering Charity is about to hit her limit while Vic and Donna Trenton are hoping to work through a bout of infidelity. I hate to admit it but I sort of had my mind made up before I even opened this book. I was positive I wasn’t going to enjoy it. There was just something inherently cheesy about the plot and when you add in the cocaine-fueled memory loss, the book didn’t have a lot going for it. However, as often happens with rock-bottom expectations, the story ended up surprising me. There’s quite a bit of that in the novel. A lot of these characters are grappling with lives that have turned out less than ideal in their eyes – it just seemed odd to craft an atmosphere of regret and mistrust featuring a raging canine as the central focus of the story. Like many before me have said, I think this may have worked better as a novella – maybe along the same lines as The Mist. There’s a bizarre subplot about a struggling breakfast cereal company that while it does help to add some depth to characters, it really isn’t necessary. Same goes for the Cambers’ trip down the coast to Boston. Where this novel really shines is in the final fifty pages or so. King gets a lot of flack for some of his botched endings over his long career (I’m looking at you, Under The Dome) but the finale of Cujo is one soul-crushing experience. I felt like my heart was ripped out. I wouldn’t put it on the same level as Pet Sematary, but it’s not far off. Those who have a hard time with animal violence should probably steer clear of this one, but I’d say King could do a lot worse.